Figs. 13-16. Crossogaster lachaisei van Noort, female: 13, head, dorsal view; 14, head, ventral view; 15, mandible, ventral view; 16, antenna, antiaxial view. Scale bars = 0.1 mm. 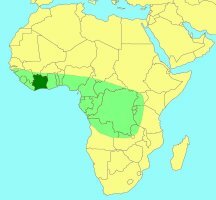 Ivory Coast, but potentially present throughout the range of the host fig (light green area). van Noort S., 1994a. Systematics of the Sycoecine fig wasps (Agaonidae, Chalcidoidea, Hymenoptera), III (Crossogaster). Proceedings of the Koninklijke Nederlandse Akademie van Wettenschappen, 97(1): 83-122.